This survey for patients with hypothyroidism has been organized by the American Thyroid Association. The results will be presented and discussed by a panel of expert physicians, scientists, and patients with hypothyroidism at the organization’s symposium in Orlando, FL later this spring. 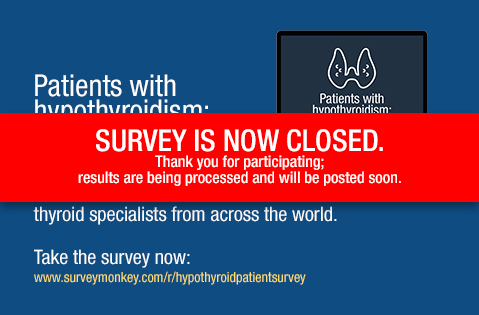 By completing this short survey, you will help the doctors and scientists understand your opinions about available treatments for hypothyroidism as well as how doctors care for you, and this will ultimately help them understand how hypothyroidism affects you and your loved ones. Thousands of patients have already completed the survey. Don’t miss this opportunity to join them in improving the lives of millions of hypothyroid patients. This timely and important ATA symposium will explore the evolution of treatments for hypothyroidism over the years. Data about TSH reference ranges in various populations and new data about T3 levels and deiodinase polymorphisms will be discussed. Topics such as the effect of supplements and diet on thyroid function will be reviewed. The symposium will be exploring quality of life in patients being treated for hypothyroidism, include a debate about combination therapy as well as a panel discussion with representatives of patient groups who advocate for those with hypothyroidism. Satellite symposium registration is available as part of the ENDO 2017 registration website. The ATA program is listed under Step 3: Events and Activities. “An important goal of this symposium is to engage with patient representatives and understand the effect of hypothyroidism on the daily lives of patients being treated with thyroid hormones” says symposium co-chairs Jacqueline Jonklaas, MD and Antonio C. Bianco, MD, PhD. To view the course agenda and to learn additional information, visit the ATA website.